Bauxite was discovered in 1821 by the mining french engineer Breathier,at the Ecole des Mines de Paris. The current spelling is due to Sainte-Claire Deville (1861), referring to the name of the village of Les Baux-de-Provence. Originally, the term “bauxite” refers to a set of similar aluminous and ferruginous rocks discovered in Les-Baux. After its discovery in Guinea, this rock was successively found in Guyana and then clearly identified in all the intertropical belt. 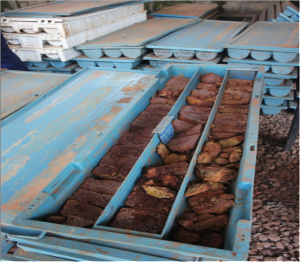 These bauxites aluminous minerals are commonly associated with hydroxides and iron oxides, titanium minerals, clay minerals and organic matter. The mineralogy of bauxite deposits is a fundamental for it determines the parameters of the primary processing alumina process (Bayer process). Generally, the alumina ore dominated by a tri-hydrate (gibbsite or hydrargillite) is easily managable at temperatures around 100 ° C while bauxites dominated by mono-hydrate (boehmite) requires temperatures greater than 200 ° C and even above 250 ° C if diaspore is dominant (as in many Chinese deposits). In other words, from a cost point of view, it is preferable to develop a dominant deposit from trihydrate ..
Bauxite is the most used ore now for the manufacture of aluminum oxide (Al2O3 alumina) as a raw material in the production of aluminum metal. Aluminum is the 3rd most abundant element in the crust, after oxygen and silicon. Very reactive metal, it only exists when combined with oxygen, mainly in silicates [Si, O, Al] and their surface alteration products. Bauxite is a rock rich in alumina resulting from the processing of silicate initially contained in the eruptive rocks (eg feldspar) or sedimentary rocks (clays), hydroxides, such as gibbsite (tri-hydrate), boehmite or diaspore (mono- hydrate), and oxide such as corundum. Lateritic bauxites based on alumino-silicate rocks of varied nature, but generally poor in silica, from which they are derived. With few exceptions, they have no sedimentary cover and are generally flush. Most lateritic bauxite are formed at the location where they are currently located. They result from the particular alteration of rocks aluminosilicate, in a tropical climate that is hot and humid. In this climate, and provided that certain conditions are met – good drainage, in particular – there is an intense hydrolysis of silicate bedrock. Alkali, alkaline earth, silica are eliminated, while aluminum, iron, titanium concentrate by accumulation. Lateritic bauxites thus formed may benefit from further relative enrichment in alumina by secondary iron removal. They can further be enhanced in an absolute manner by importing alumina from higher backgrounds. Gibbsite is the essential mineral lateritic bauxites, where bœhmite can intervene locally. Diaspore is known but exceptional. Lateritic bauxites are about 85% of the world’s bauxite resources, 45% are located in the Republic of Guinea. The largest producers from this type of deposit are Australia, Guinea, Jamaica and Brazil. The karst bauxite always rely on a limestone or dolomitic wall and are often covered by a roof that can be sedimentary nature, age and different origin. The most common mineral assemblages of karst bauxite are: bœhmite-gibbsite, boehmite, diaspore-boehmite, diaspore. The sits in one gibbsite are very rare. If the mode of formation of lateritic bauxites is now essentially well-known, it is not so with the genesis of karst bauxites. Generally karst bauxites are also resulting from lateritization process, but on a limestone substrate and hydrolysis conditions a little different, with a little more Mediterranean climate. The interpretation still raises hypotheses and controversies whether the karst bauxites developed on site or result from an accumulation in karst traps after transport.